Description: Aerial view looking east toward Eastborough and beyond. Douglas Avenue runs along right border and divides just east of intersection with Woodlawn Boulevard. Residences built or under construction along St. James Place, Hillcrest Avenue, Norfolk Drive and Highland Road. Photograph taken March 8, 1929. Description: Aerial view looking east toward Eastborough and beyond. Woodlawn Boulevard runs from left to right along lower portion; divided Douglas Avenue is at right. Construction of residences in Eastborough began in 1928. Photograph taken March 8, 1929. Description: Aerial view looking east toward Travel Air Airplane Manufacturing Company near intersection of East Central Avenue and North Webb Road. Unit C factory under construction. Photograph taken March 8, 1929. Keywords: Wichita, aerials, aviation, business and industry. Description: Aerial view of West Wichita showing commercial, residential and industrial districts. Prominent commercial buildings include Wichita Hospital and Palace Block at lower left. Confluence of Little Arkansas and Arkansas rivers at top left; just below is portion of Ackerman Island lying north of 2nd Street bridge. Keywords: Wichita, aerials, business and industry, bridges, rivers, buildings. Description: Birdseye view of the Wichita Municipal Airport. A Douglas DC2 plane owned by TWA is in the foreground. The airport is located on South Oliver. Keywords: Transportation, aviation, plane, aerials. Description: Aerial view of Stearman Aircraft factory completed in late 1930 on South Oliver Street. 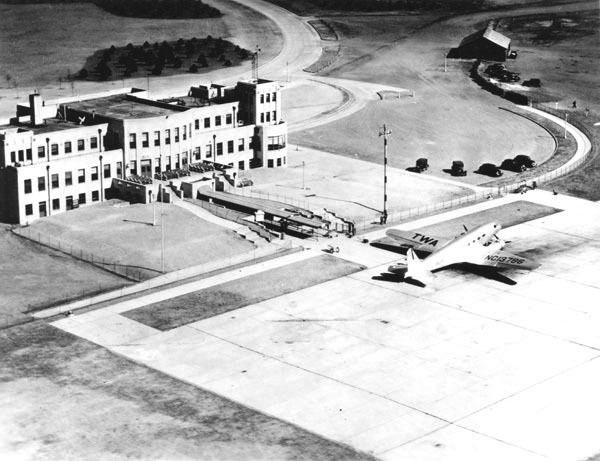 View is looking northeast toward biplane flying over factory, and hangars and partially completed administration building at Wichita Municipal Airport. 31st Street South angles across center of image. Keywords: Wichita, aviation, business and industry, aerials. Description: Aerial view of Wichita Municipal Airport and parking areas, at 3800 South Oliver. Keywords: Wichita, aviation, transportation, aerials, airports, airplanes. 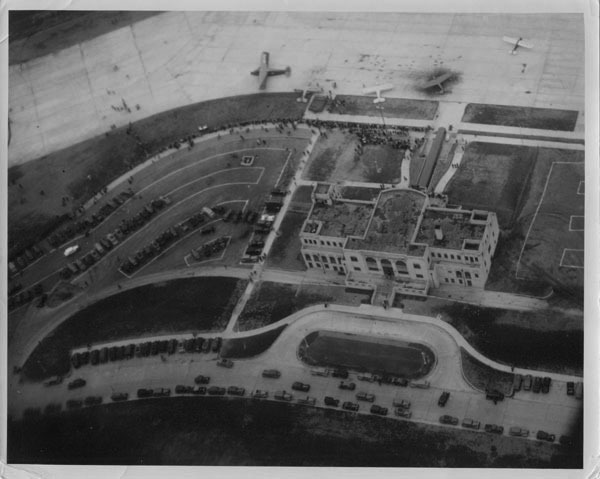 Description: Aerial view of Stearman Aircraft Company factory and administration building completed in late 1930. View is looking southwest. Oliver Street runs along lower edge of image, and road that intersects it leads to Wichita Municipal Airport. Keywords: Wichita, aerials, aviation, business and industry, buildings. Description: Aerial view of industrial area in Wichita's North End. Grain elevators, oil storage tanks and refineries, meat packing plants and railroads all visible in view looking south toward downtown from near 29th Street North. Keywords: Wichita, aerials, business and industry, transportation. Description: Aerial view of Ben Sibbitt Iron and Foundry Company located at 217 Moore Street.